Running a starship repo company isn't easy or cheap. It's just an endless string of fuel costs, ship maintenance, legal red tape, unhappy debt bailers, shady associates and uncooperative dock officials from one end of the galaxy to the other. 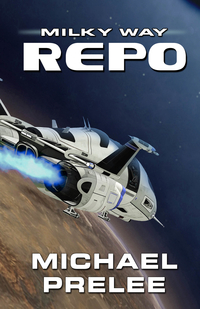 When Nathan and his crew successfully steal a freighter from the clutches of a particularly tenacious and corrupt dock official, he earns the respect of their high profile employer. Opportunity seems a sure thing. Nathan should be happy. But when that lucrative job op turns into a ransom delivery for a starship crew being held hostage by a cult, he suddenly finds himself pursued by a self-immolating loan shark hell bent on collecting a gambling debt. Michael Prelee is a writer living near Youngstown, Ohio. A graduate of Youngstown State University, he lives with his wonderful wife and two great children.